Distance from city center: 20 km. 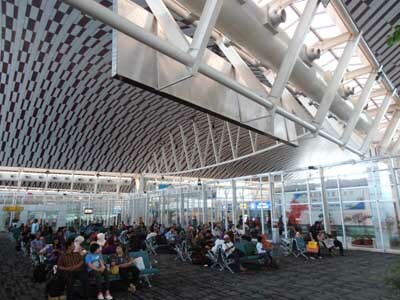 Which airlines fly to Sultan Hasanuddin International Airport? How many runways and passenger terminals does Sultan Hasanuddin International Airport have? The Makassar Airport has two runways and a new passenger terminal which opened in 2008. The new terminal of Makassar Sultan Hasanuddin International Airport is spacious and comfortable making it one of the best airport terminals in Indonesia. The terminal is built for the future with free wifi, spacious shopping area and it can accommodate the Boeing 747 Jumbojet. 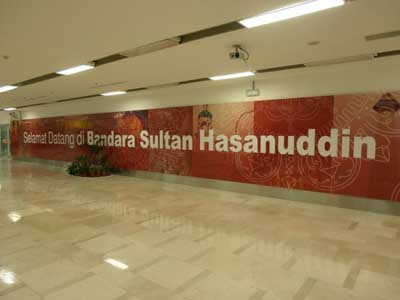 Where is Sultan Hasanuddin International Airport located? The airport is located 20 km northeast of Makassar. 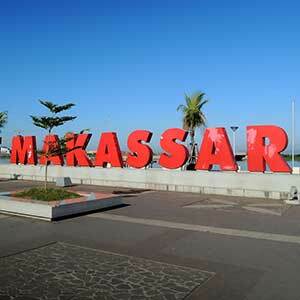 How to get from the airport to Makassar city centre by public transport? Since recently there is an DAMRI airport bus which drives between the airport and Makassar city center. It operates between 08:00 and 00:00 and departures are hourly. A one-way ticket is 27.000. You can find the bus in the basement: when outside the terminal turn right and pass all the taxi's, go down to the basement and at the far end you will find the Damri airport bus waiting. How much does a taxi cost from the airport to Makassar city centre? Taxis to the city booked at the taxi stand have the fixed price of Rp 100.000. You can try to get a taxi direct from the driver but it will not be much cheaper. They will offer you Rp 70.000 but then it does not include the toll fee. What are popular destinations from Sultan Hasanuddin International Airport?